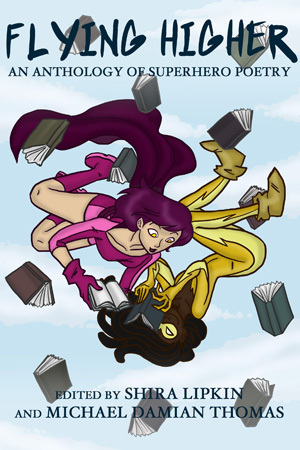 This collection apparently sprang from a writing challenge among some friends to write poetry about superheroes, which is a sub-genre you don’t hear of very often. There’s horror poetry and science fiction poetry and all kinds of other poetry, but this is just about the first time I’ve ever heard of superhero poetry. I never even imagined such a thing could be, and I write about superheroes an awful lot. So here we are — a collection of poetry about superheroes, some long and profound, some short and silly, some villanelles, some haiku, some limericks, some song parodies, some blank verse. We’ve got some that focus on established characters, and some that are about independent or generic heroes or villains. and Mary Anne Mohanraj’s “Princess of Gemworld,” which focuses on the secret tragedy of Amethyst’s existence. And of course, plenty of others besides. I could almost list all of them, except then I’d just be listing the table of contents, and no one needs that. Verdict: Thumbs up. I love the complete unexpected surprise of this. I really never considered the idea of writing poetry — serious poetry — about superheroes. It still seems like an odd idea, and I’m not sure I could ever manage to do it myself. But I’m glad all these poets managed to wrap their brains around the concept so well. The variety of poems is very good, with serious works side by side with less serious ones, along with enthusiastic geekery, poets who are entirely ambivalent about superheroes, tributes to comics, films, and more than one real-life hero. There’s something here for everyone. Oh, and did I maybe forget to mention that it’s free? Because the entire book is free. Trust me — it’s good enough for you to pay money for, so you definitely better pick it up when it won’t cost you a dime. Thank you for the review! And I’m not just saying that because you called out mine and my husband’s poem as favorites!